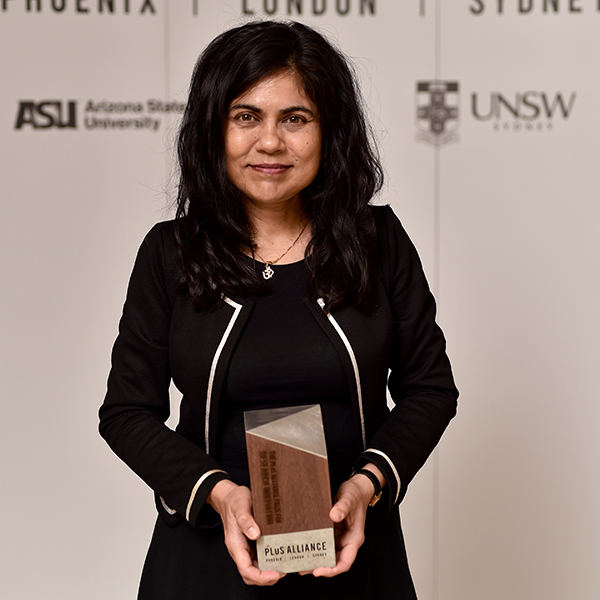 Australian Research Council (ARC) Laureate Professor Veena Sahajwalla is revolutionising recycling science to unlock the wealth of resources embedded in the many complex and toxic wastes currently destined for landfill. As a materials scientist and engineer and founding Director of the Centre for Sustainable Materials Research and Technology (SMaRT) at the University of New South Wales, Sydney, she is producing a new generation of green materials, products and resources made entirely, or primarily, from waste. Veena also heads the ARC Industrial Transformation Research Hub for ‘green manufacturing’, a leading national research centre that works in collaboration with industry to ensure new science is translated into real world environmental and economic benefits. Numerous international and national honours have recognised Veena’s research and leadership; most recently, she has received the 2017 PLuS Alliance Prize for Research Innovation and became the first woman to be awarded the prestigious Jubilee Professorship by the Indian Academy of Sciences.